PHOENIX – The inaugural Arizona Concours d’Elegance, held Sunday, January 12, on the landscaped lawns of the historic Arizona Biltmore resort in Phoenix, presented a selection of 75 magnificent automobiles for a highly successful first-time event, with winners announced for vehicle classes, special awards and Best of Show. 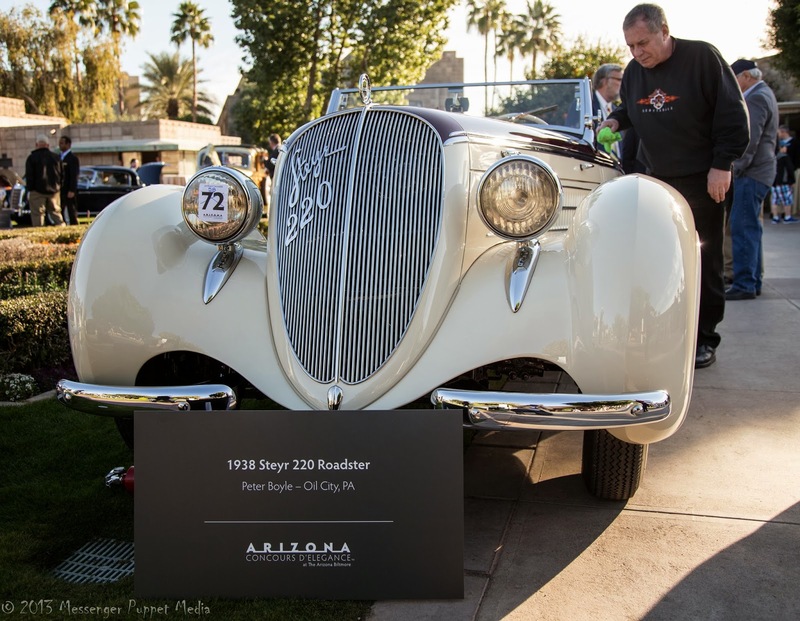 Under brilliant blue skies, more than 2,000 people enjoyed the balmy Phoenix weather and the sights and sounds of a top-drawer concours celebration of automotive finery in an exclusive and intimate setting. The Arizona Concours is an event long envisioned by auto enthusiasts to serve as a starting point for Arizona’s famous collector-car auction week. The 1925 Hispano-Suiza H6B Cabriolet de Ville owned by Donald Nichols of Lompoc, Calif., won Best of Show honors from the impressive field of concours contenders. Nichols discovered the car in 1970 sitting in derelict condition in a Sarasota, Florida, alley and finally completed its restoration just two years ago. The Hispano, with coachwork by Kellner, was originally owned by the famous industrialist Andrew Mellon. Nichols kept the car for nearly four decades before undertaking the daunting challenge of restoring it. The beautiful result was chosen by the Arizona Concours judges as the event’s first Best of Show. The Best of Show trophy was sponsored and presented by Alfredo Molina of Molina Fine Jewelers of Phoenix. The Hispano also was awarded Best of Class, Full Classic European. Among the special awards presented during the Concours, one standout was for the car chosen by the Wish Kids, nine young people who are part of Make-A-Wish Arizona, the founding chapter of the international organization that grants wishes to children with life-threatening medical conditions. Make-A-Wish Arizona is the charity recipient of the Arizona Concours. The first Wish Kid award was a 1939 Bugatti T57C Galabier owned by Bill and Linda Pope of Paradise Valley, Arizona, that the nine kids chose from the concours field. The specially prepared trophy features two fanciful figures made out of car-engine parts. Make-A-Wish Arizona raised $24,000 through the Arizona Concours, which will fund future wishes for three kids, according to spokesperson Lisa Evans. Post-war Preservation — 1967 Ferrari 330 GTC (Todd Reeg, Scottsdale, AZ). Preparations are under way for the second annual Arizona Concours d’Elegance in January 2015. For more information, see http://www.arizonaconcours.com. The Arizona Concours d’Elegance, 501(c)(3) status pending, celebrates classic automobile engineering and style while supporting local charities.